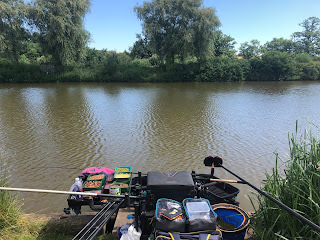 Feeder rods were the first out of the bag, one with a hybrid feeder and the other a more traditional open ended feeder, both rods clipped up around 2/3 the way over my half of the lake. The pole lines would be simple, top 2 and two sections for straight ahead and also the margin. 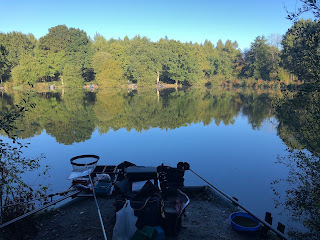 The depth of the lake from my peg very even at around two and a half feet so the same rig could be used for both swims. Bait selection was mainly pellet and groundbait, backed up with some maggots, casters and sweetcorn although I'd be fishing 8mm dumbbells and pellets on the feeder line. A ball of groundbait on both the pole lines together with some maggots thrown and out on the feeder. Quick chucks to start with to make some noise for attraction and to get some bait down, so recasting every 2-3 minutes. Tommy next to me decided to put about 4 feeder fulls at the start and then fish over it. I had some early indications of fish around the feeder but no real takes. After 90 minutes and with nothing in the net, finally a decent take on the hybrid feeder resulting in a beautifully formed common carp which was quickly followed by another fish albeit smaller, bites then tailed off. The far bank where catching some fish and it appeared our bank was struggling. 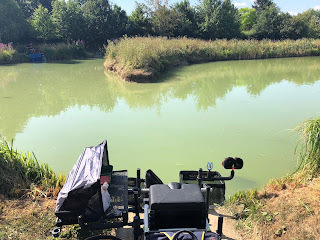 A change to the open ended feeder and maggot got an instant bite but it was a small skimmer, of the like I knew I could catch a lot quicker close in. I decided I needed to put some more fish in the net so I went on the short pole line and was into small silvers straight away. 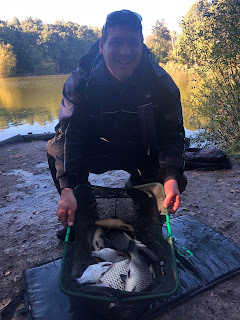 At the end of the day we knew that we could not compete with the other bank and that we were fishing for the section, a couple of decent hybrids together with tiny roach and gudgeon I put quite a few silvers in the net, not a massive weight, before trying the margin line. Tommy next door had also gone on the pole in the margins and was taking some smallish carp from it. My float dipped and elastic was quickly being dragged under the bush. Pole tip underwater and eventually I managed to get the fish into open water ready for netting. I was playing with fire as I was seriously undergunned for fishing the margin with a light elastic so I changed to dropping the hybrid feeder on the line. The first fish managed to get under the bush and with the rod bent over eventually the 0.20 diameter hooklength gave way. New hooklength and straight back on that line. I managed another 3 fish from the margin to end up with 6 carp and a bunch of silvers when the all out was called. 15lb 2oz getting beaten by 4oz for the section win by Tommy on peg 3. The fair bank was won from peg 18 with a 38lb 14oz weight which didn't include the 12lb pike that he landed! 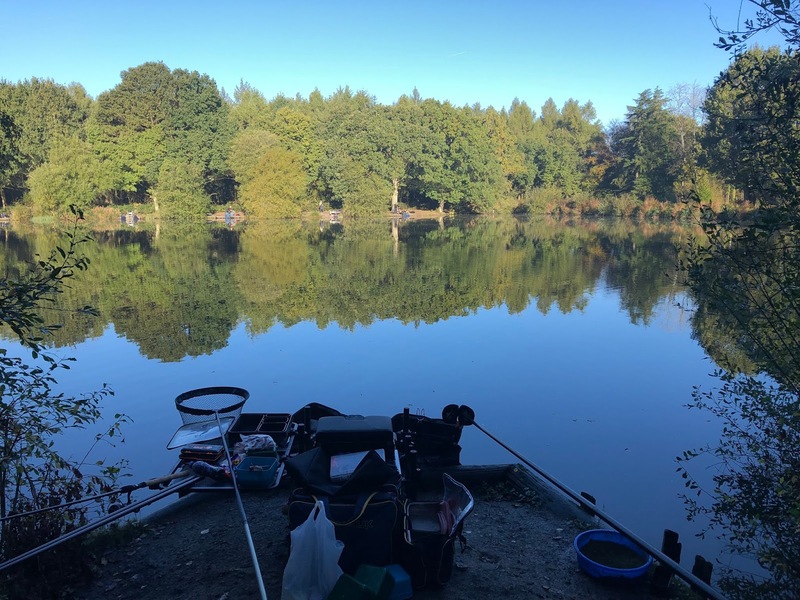 Well the bream did not make an appearance on the feeder lines as the lads mentioned that normally you have to get through the bream to get to the carp. From our bank, all we had was carp, not in huge numbers but carp none the less. I certainly failed to prepare which resulted in preparing to fail if only for the sake of putting one more tube in the holdall. The carp in the margins definitely know where the cover is so next time I'll be prepared with heavier elastic and lines. 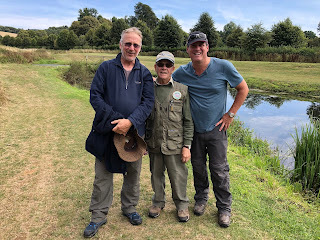 A great day out with the Farnham guys and very happy with the results for the day from a fishery I'd not visited before and I did eventually fish out my sunglasses! Next stop Badshot Lea Small pond.